A little beyond Highbury Corner, just off the traffic jams and restless hustle of Holloway Road, are some silent giants. The giants in question are trees – any mental association with Arsenal, The Emirates and hushed crowds, or the sylvan stiffness of certain Germanic central defenders, is entirely in your own imagination. Trees, on the whole, tend to stand out. Sheer size alone gives them visual impact. They are big, beautiful silent presences in our lives. However some species, although not exactly invisible, tend to go unnoticed a lot of the time, especially in urban environments. I’m thinking in particular about The London Plane (Platanus x hispanica to give its more formal title). There are examples everywhere: on the streets, in parks, squares, even the middle of traffic roundabouts. The trees are so ubiquitous it’s easy to walk past them every day without really noticing they are there. The species’ common name is London Plane, but the tree can be found in towns and cities throughout Europe, in Australia and North and South America. The NYC Parks Department uses the leaf as its symbol. That said, the trees are not entirely welcomed by all, as the London Plane, despite the name is not a native of the British Isles. This means that unlike native plants it supports little other insect and birdlife. 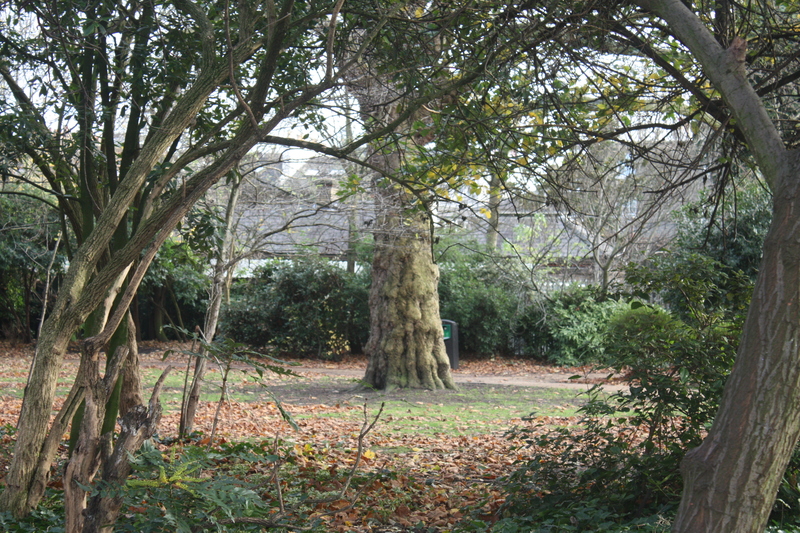 Unlike the English Oak, for example, which typically harbours hundreds of insect species, London Plane only supports one, (what that one is I haven’t been able to ascertain, but the reference comes from this George Monbiot article in The Guardian) so is therefore of little interest to birds – other than as an occasionally convenient resting point. 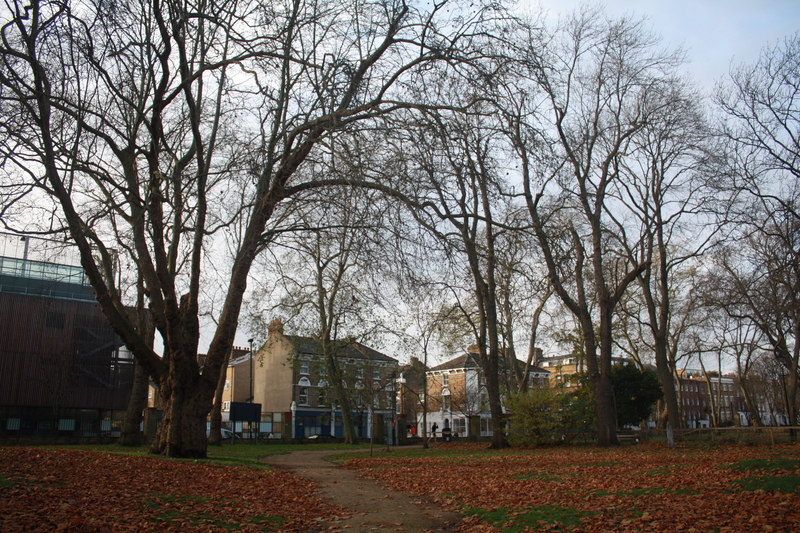 For the moment though the London Plane is with us, lining the streets, driven and walked past constantly and largely ignored, except when playing convenient host to ‘Missing Cat’ posters, gouged with the names of teenage lovers or the markings of passing strangers. Unless you stop to look closely, they all look pretty much the same – tall grey things, winter-scarred sometimes with large maple-like leaves that seem to carpet the pavements throughout Autumn. However, like most things, when you stop and look a little more closely, they are not all the same. 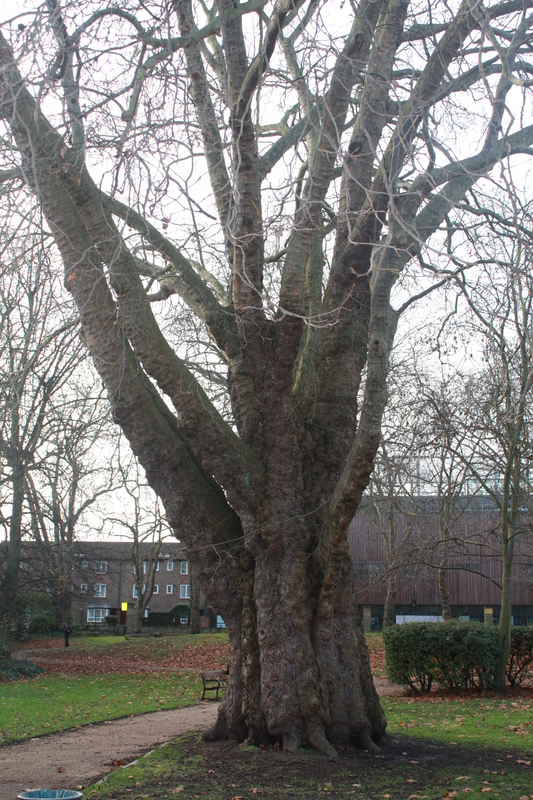 Some London Plane trees can live for a very long time, achieving an impressive girth and expanding at the waist like a middle-aged accountant, only without the elasticated trousers. 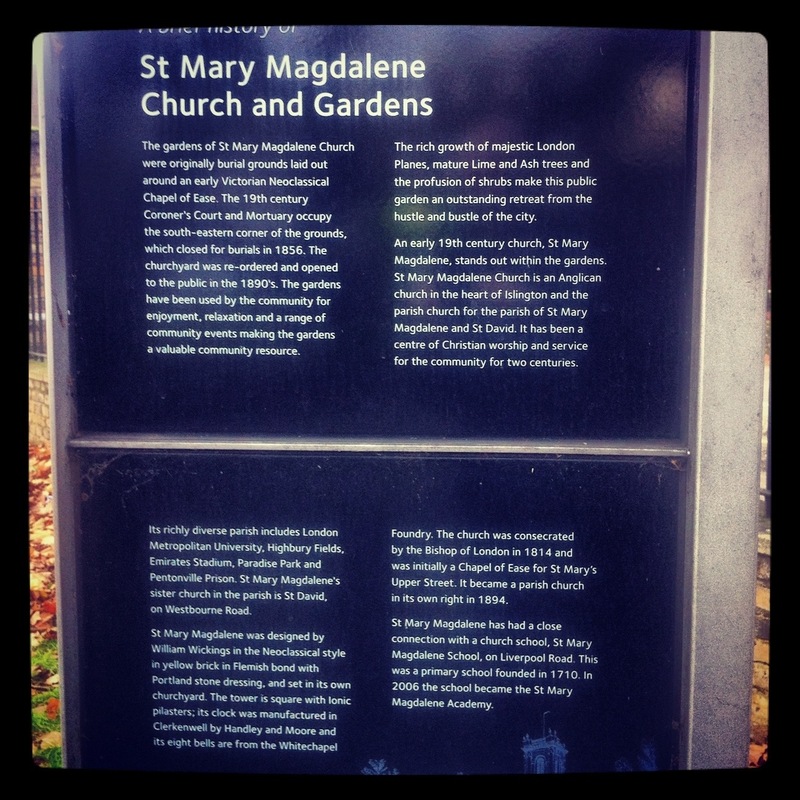 The giant trees of the title are London Plane and they can be found in Islington’s St Mary Magdalen Gardens. In the churchyard there are some magnificently large and elderly specimens, some of them more than 250 years old. When I stop to look at them, I sometimes try to picture the scene as it may have been when they were saplings – aside from a few cottages on Liverpool Road, pretty much nothing else in the surrounding areas, from the Church itself – built in 1814 as a chapel of ease to Islington parish church – to the houses, flats and shops of N7 would have been in place. Hard though it is to imagine, even the adjacent traffic-choked A1, nearby Holloway Road, is an ancient route into London, once passing through a largely rural landscape from the village of Highgate and down into the city. The road’s very name, may derive from Hollow Way – typically a tree lined track, grooved deep into the ground by erosion from the passage of people and animals walking over and over its course for centuries. There’s no proof of the connection but the road was one of the main routes cattle were driven down from the North into Smithfield. Historical romance aside, the present day site is well worth a visit, but don’t expect a private slice of bucolic charm. The churchyard is a little on the rundown side and it’s in the middle of a busy area of North London, so don’t be surprised to see dog walkers, kids on bikes, passers-by grabbing a bench to shout into their mobiles from, along with the odd homeless person resting up, or tramp drinking. To me though all this is what makes the place distinctive and interesting. A unique spot, surrounded by a vast city that has grown up around it, with its giant trees serving as a reminder that although a place may be very old, nothing is permanent. Trees – particularly the ash – have been making news recently, sadly none of it good. Ash dieback disease – caused by the fungus Chalara fraxinea – has arrived in the British Isles and threatens to kill off the majority of our mature ash trees. This would be a loss on a vast scale, terrible in purely physical terms but the disappearance of a tree that is prolific in England would also effect a seismic transformation of the British landscape. Aside from the ecological impact, in purely visual terms everything would look different, emptier, sadder, because this isn’t simply about a few specimens hidden away in mixed woodlands, but trees all over England could be lost – in fields, in parks and back gardens everywhere. 100,000 ash trees have already had to be destroyed. In Denmark 90% of the country’s ash trees have been affected. To find out what’s being done and what you can do to help The Woodland Trust website is a good place to start. Finally, for a reminder of what a devastating loss the disappearance of the Ash could be, there’s an excellent post by photographer and painter Diana J Hale on her blog. I have never seen such a tree, and I hope i have the opportunity one day. So sad that the trees have to fight so hard to survive against disease and neglect. It seems to be one after another at the moment! Lovely to see these local giants given their moment of fame.Thanks for the mention too. All rather depressing really. Let’s hope at least some of them can be saved. 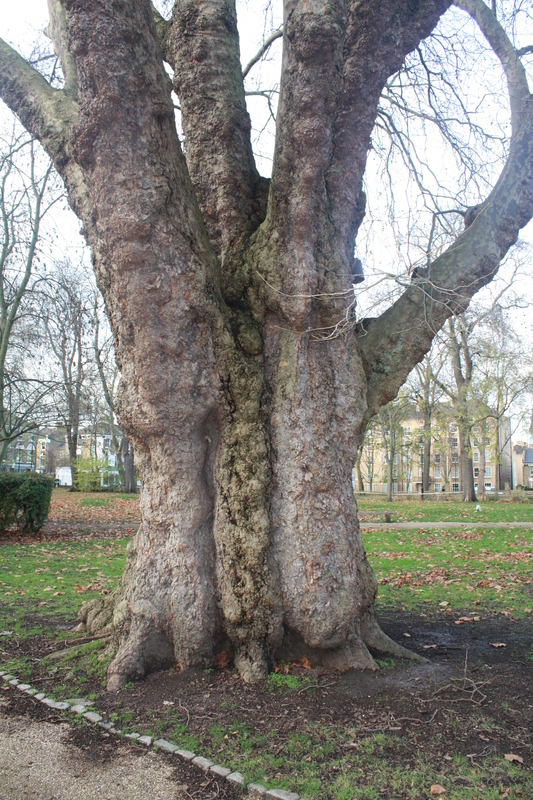 As for the London Plane’s, there are some more impressively large ones in Coram’s Fields in Bloomsbury – well worth a look, but I think probably better known.